Blue Book Services has been a staple for knowledge and reliability in the produce industry since 1901. 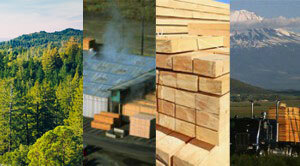 We bring that same prowess to the lumber and forest products industry. Firms in this market can find new business connections and have access to in-depth Business Reports covering retail lumberyards, wholesalers, industrial accounts, secondary manufacturers, lumber mills and more. This could potentially be the edge that sets your company apart from the rest. Making quick, smart decisions can assist organizations in growing sales, one big advantage of joining Blue Book Services. Our lumber industry database assists with credit extensions and helps businesses get a better feel for the industry. Companies will also be able to identify and examine current and perspective customers with our real-time search engine, form leads lists for your teams to use and analyze business relationships with our Business Reports. The searchable data offered via our web site is the only industry-specific source that provides analyst-based credit information. The knowledge gained from this resource gives executives improved confidence to help make smart decisions and find the best possible leads for their company. While we are still relatively new in the lumber and forest products industries, Blue Book Services offers something other organizations cannot: More than a century of experience in business. Unlimited access to our Blue Book Online Services, real-time information, in-depth reports and our “Pay Indicator” will surely bring value to your company.